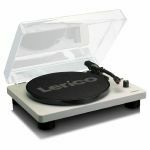 Notes: The Lenco L-88 is the latest generation of ultra-slim modern turntables and comes backed by over 70 years' experience in precision design and engineering. 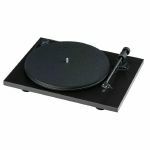 Lenco have a multi-award winning history and were one of the world's first commercial record player manufacturers, the L-88 features modern design and features but still holds true to the brands ethos of turntables designed by music lovers, for music lovers. The L-88 features belt drive technology which delivers consistent platter speeds and minimises vibrations from the motor so you have the best possible listening experience. The dual speed rating for 35RPM and 45RPM gives you great flexibility to listen to vinyl old and new. 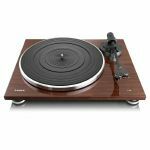 As you'd expect from one of the world's foremost turntable brands, the L-88 sounds as good as it looks. The premium Audio Technica cartridge, included at no extra cost, delivers great detailed sound. The L-88 also features an integrated stereo pre-amplifier which means the turntable can be simply connected to your existing HiFi set-up, or used with any powered speakers, without the need of an additional external amplifier. Take the opportunity to convert your vinyl records to digital formats as a convenient back-up or to listen on digital devices (iPods, Phones, Tablets and MP3 Players). It's simple to connect the turntable to your PC or Laptop and then conversion is intuitive. The L-88 delivers premium audio performance but also features an ultra-slim modern design that would grace any home. The L-88 also features a bold white gloss finish for a sophisticated look and feel. To ensure you keep your vinyl records in tip-top condition with the L-88 you'll receive a premium anti-static cleaning cloth at no extra cost. The micro-fibre cloth is specifically design to remove dust and grease to ensure your vinyl is perfect every time you listen. Includes anti-static microfiber cleaning cloth. Notes: Listening to analogue records has grown in popularity enormously over the last couple of years. 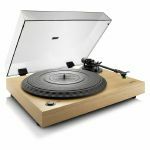 This trend has enticed a lot of manufacturers from far and wide to enter the turntable game. These new players are trying to get a piece of the cake with plastic, features, low quality and cheap prices. They forget what makes a real turntable - sound quality! Only with high quality components and precision can you extract all the detail from the micro-grooves of your record. Plastic, lightweight platters, flimsy tonearms and low-quality cabling with primitive cartridges are not suited for real HiFi grade turntables. With a smart tonearm design, Project combine pure sound quality with an easy setup. This plug & play design with pre-adjusted tracking force and anti-skating has saved costs and is extremely efficient - with no compromise in sound. On contraire, the lightweight and low friction aluminium tonearm is optimized for the Ortofon OM series and will bring out its maximum potential. With intelligent construction and without needless features Project have kept the price attractive, despite this product being hand-made in Europe.